The Cooking Photographer: Disappearing Marshmallow Brownies? I don't know how this blondie recipe came to be called a brownie, but I do know they're chewy and decadent. They're also kind of ugly by nature as the dissolving marshmallows leave a few craters. You know the song “If You Wanna Be Happy”, by Jimmy Soul? The one where he tells you to get an ugly wife. These brownie-blondies are exactly that. Not pretty, but they’ll sure make you happy! I cut the bars into diamonds by slicing them into strips the long way, and then cut them diagonally across the strips. This left me with lots of gooey, chewy, buttery little ends. At this point I was compelled to make a big pot of coffee to enjoy the discards all by myself. Discarded ends don’t count for calories anyway, right? 2. Using a microwave-safe bowl, melt the butterscotch chips and butter together in the microwave, stirring occasionally until smooth. Set aside to cool. 3. In a large bowl, stir together the brown sugar, eggs, and vanilla. Mix in the melted butterscotch chips, then the flour, baking powder, and salt until smooth. Stir in the marshmallows and chocolate chips last. Spread the batter evenly into the prepared baking pan. 4. Bake for 15 to 20 minutes in preheated oven. Cool, and cut into squares or diamonds. Notes: I line my pan with foil before greasing. Once the bars are cool I freeze them for about 30 minutes and then lift them out of the pan by the foil for easier cutting. Recipe submitted by Maryl to Allrecipes.com. Picture by Laura Flowers. These blondies were one of the first things I baked when I was a teenager - not with the marshmallows however, but I bet that addition makes them even more addictive. I love blondies and yours sound especially chewy, the best kind! Have a great week Laura! I love the fact that you cut them into diamond shapes. Good idea! Yum....I'm not the biggest fan of chocolate brownies, so I like this naked version of it! And marshmallows! Lovely! These look great... who cares if they are not the prettiest. Doesn't stop me from wanting to dig in! Yum!! I saw Sophia's note above-congrats on winning this round of BSI! And no, those odds and ends do not count! great pics and a lovely recipe! Yup! Discards, even if they come from this super yummy brownie, don't count! So enjoy all you want! You deserve it. AHA! So that's the secret to cutting diamonds...can't believe I hadn't worked that out yet, so thank you! 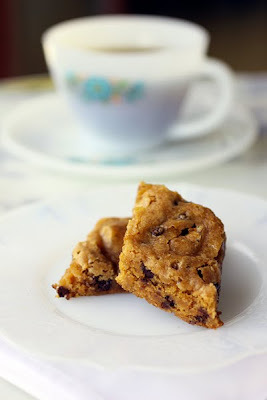 And you're so right, the end/scrap bits of all baked goods contain zero calories :) Great looking blondies. deliziosi questi biscottini!! aspettami che arrivo!!! un abbraccio!! Those look delightful! I love blondies. It was the one recipe of my grandmother's I wanted when she passed (and I found it was a recipe from the side of a box!). This one looks heavenly. I've lined my pan with foil before, but it didn't work that well, but I like the freezing part. That may help me in the future. I have a peppermint patty brownie that I am determined to get right. Oh yum! It's been my experience that ugly baked goods usually taste the BEST! Especially pie, for some odd reason. I never count the "throw away" ends as real calories-- Are you kidding? These look so delicious. I love blondies but I never make them that often. Thanks for the reminder! Oh how I could go for one now with a cup of joe. They look delish. I need to get on this brownie-blondie bandwagon....they look so good! Not ugly at all :). The diamond shapes are pretty, and I can believe the taste is fabulous.